My niece turned 6 last week and we celebrated in real princess style. We had a family get-together with our littles. 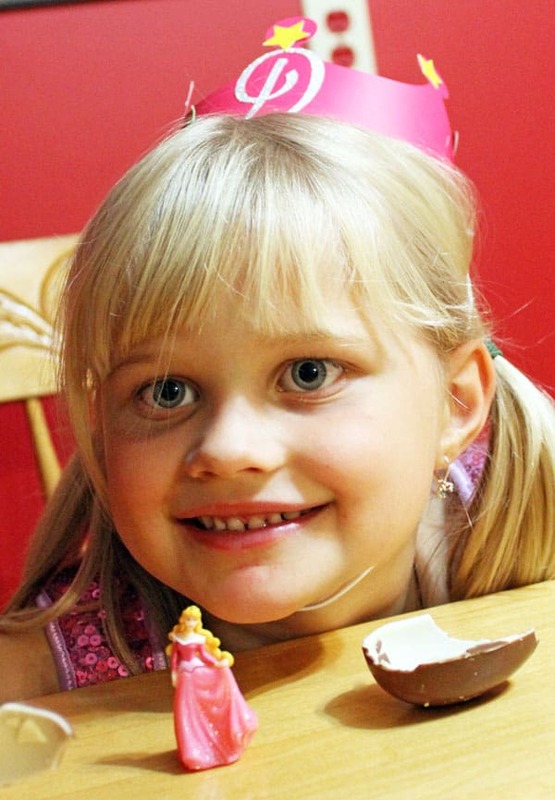 The kids wore their Princess finest, ate tea and crumpets (ok… it was pizza and juice but we can pretend), made the cutest Princess Party Crowns, and topped off the afternoon with a tasty Kinder Surprise with a fun Disney Princess Treat! 1. Cut crowns using Silhouette Cameo 3D adjustable crown. If you don’t have an electronic cutter you can use this crown template to cut with scissors. I used heavy weight cardstock to keep the crowns from buckling. 3. Have children embellish crowns. I provided starts and glitter monograms, I ran them through the xyron first so they had adhesive backs. No cutting or glue so this craft is really quick! 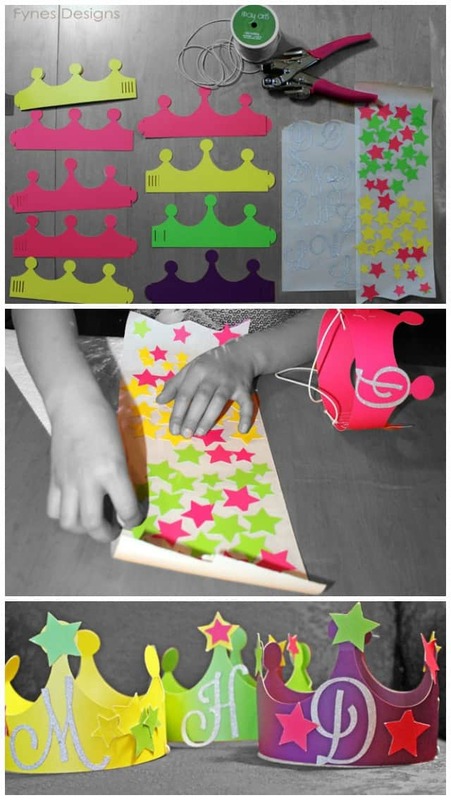 You could also used gems, stickers, and foam shapes to decorate your Princess Party Crowns. Since I’m a #KINDERMom this year (woo hooo!!) the kids all got a special Kinder Surprise treat. Kinder just released Disney Princess and Marvel Superhero toys in their eggs, two in three eggs within specially-marked Kinder® Surprise® packages will contain a Limited Edition toy. 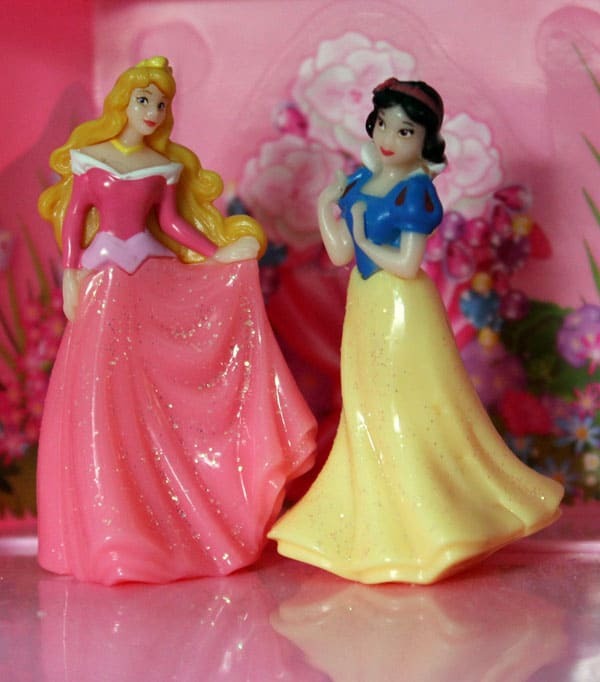 What is more fitting for a Princess Party then a small Disney Princess treat to take home?! The children were over the moon to get the delicious milk chocolate treat, with a super fun toy inside! Want to check out all the fun Limited Edition toys? 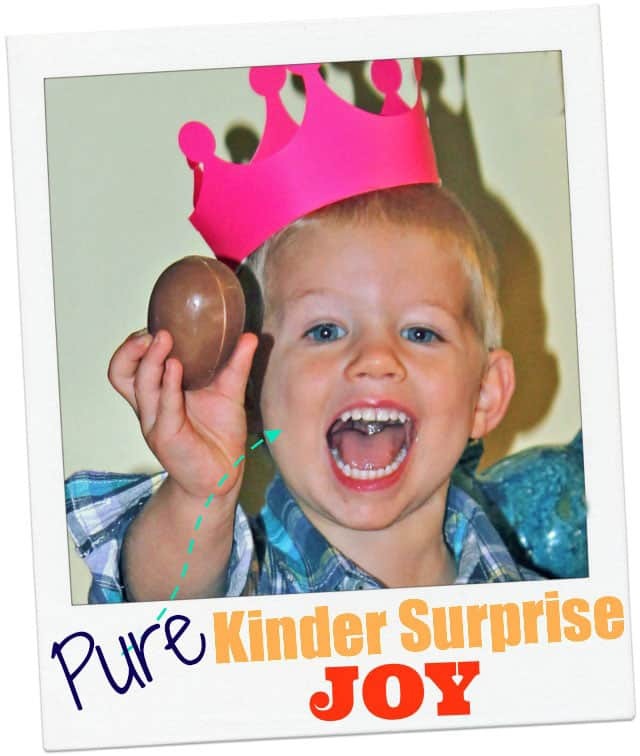 Check out Kinder Canada on Facebook. When I was a child I got a watch and it came with a Cinderella figuring that looks so much like the ones that your girls got. It brought me way back… over 40 years I’ll have to say. They are so cute. Super cute! Great craft for a princess birthday. My niece turns 5 next week & these would be great for her party. Will have to send this to my sister. 🙂 Thanks for sharing! Shoot! That should be 4. She turns 4. Getting waaay ahead of myself. LOL! I loved making crowns and watching princess movies when my children were little. Why did they have to grow up. Enjoy this time with you girlie because in the blink of an eye they are all grown up. Love a good kids party with arts & crafts! That’s my way to go for sure. And you know I need to get a Silhouette already. so cute! and a lot of fun too! Fantastic, Virginia! My daughters would LOVE this craft (and it just so happens that I have a Silhouette handy for occasions like this)! Every day is a princess tea party at our house! Seriously! Love the little crowns! I know what you mean, we live in a fairy tale land… however the millions I dream of never appear?? Those turned out really cute. Looks like the kids loved them! 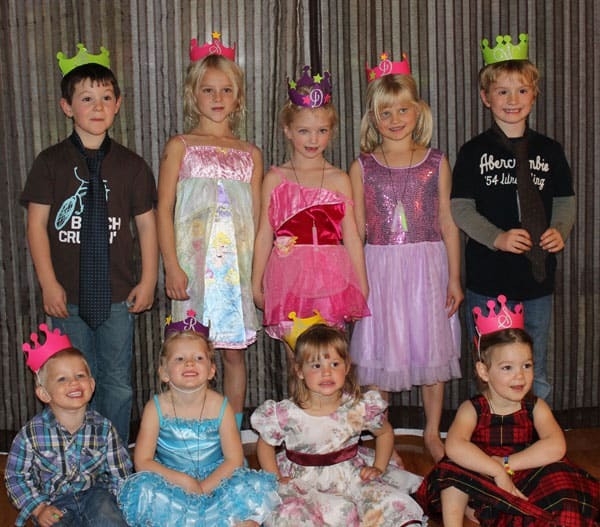 So cute – both the crowns and the kids!